About: Snappy Snaps offer 1, 3 and 48 hour film developing. The minimum charge is three pounds ninety-nine. They also do enlargements and reprints. In addition they also sell cameras, picture frames and photo albums. 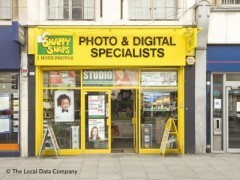 I am writing this review as a local man and have used "snappy snaps " streatham several times as they are close to me and i dont really have any other developer near me. i find the service to be abysmal, the quality of prints is poor at best, one lot had dust specs over the prints, another lot, i had them re-do were orange in colour (this can be down to the fix being old or the temparture too high), my recent lot were faded out and had light on the right hand side of the print, as though they were exposed to light whilst developing. I worked in the print industry and developing film was part of my job, so i am no stranger to the darkroom, although these are done digitaly, i can identify the problems with the finished print. i.e. little quality control.